Down six to the Steelers on the road, Michael Vick and the Eagles took the field near the start of the fourth quarter. After three short gains, the Eagles faced a 4th-and-1 from their own 30-yard line. 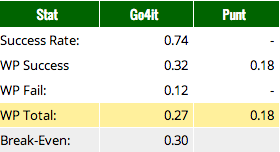 In today's NFL, this is an easy decision for coaches: Teams punt the ball over 90% of the time. Since there was still significant time remaining in a one score game, it's safe to assume that the Eagles should have performed similarly to a score and time-agnostic situation (although obviously it had some factor in Reid's decision). Reid was feeling some extra confidence from his tufty moustache, so he decided to go for it. I mentioned it was an easy decision for coaches to punt, but is it the right decision? On 4th-and-1 from your own 30, the league-average success rate is 74%. Both using win probability and expected points, we can see that the correct decision is to go for it if you believe you can convert above 56-58% of the time. 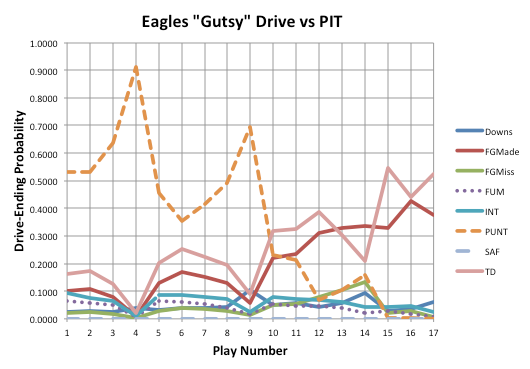 The conversion increased the Eagles chances of winning to 24% and they would continue the drive. No praise for Andy, though. He would only be ridiculed if the decision had failed. Five plays later, he faced another fourth down, this time from the Steelers 47-yard line. At this point, Andy was all-in and with the clock becoming more of a factor, he once again made the correct decision to go for it. 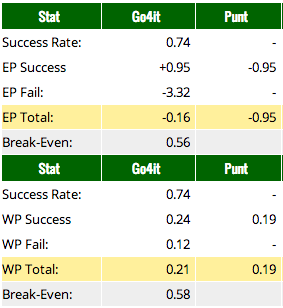 A success increases the Eagles win probability to 32%, a failure drops it to 12% making the break-even point for deciding to go for it over a punt a mere 30% conversion rate. The Eagles would convert on two more third downs on the drive capping off a 17-play 79-yard TD drive that lasted over 8 minutes. Unfortunately, too much time was left on the clock as Big Ben orchestrated a game-winning field goal drive. No one will remember Andy's "gutsy" correct calls since they lost; and he would have been crucified had either of the attempts failed -- in particular, the first one. As always, it's important to evaluate these decisions based on the process, rather than the outcome. As a side note, the Eagles also burned two timeouts early in the second-half that ultimately could have had a huge impact on the result of the game. 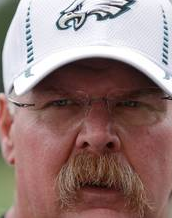 That is an Andy Reid specialty. The Browns did similar in the first half but the commentators said it was because they had "nothing to lose" since they were 0-4. Burning timeouts early is a Chicago Bears specialty as well. It hasn't seemed quite so bad this year, but man, the last several years were awful about that. Did anyone ever attempt to analyze the EPA/WPA changes from calling a timeout instead of taking a delay of game? I know there was talk about it last year. Looks like thee post "Lovie's Latest Blunder" from two years ago is the best breakdown of the value of a time out. If I ever get the time, I'm going to look really closely at the timeout issue. I'm not exactly sure how to prove it, but I believe that the conventional wisdom that coaches like Reid that "burn" timeouts is wrong. It strikes me as following the same "don't do anything risky now, we can always win later" logic as the 4th down issue. If a big 3rd down is coming up and the QB gets to the line of scrimmage and sees the worst case scenario defensive alignment, do you want him to call timeout or do you want him to run the play that isn't likely to work. I know that audibles are an option, but for several reasons, I think they are likely to have a lower success rate than calling timeout and rethinking the play. Conventional wisdom says you should just save the timeout, even if it substantially lowers your odds of success on a key play. I think that is just insane. A timeout might or might not prove useful in the last two minutes of the game. More points will definitely be useful. Spending timeouts does not necessarily equal wasting them. You're definitely right, Jeff, that there are situations when a timeout IS worth it to "burn". But the majority of these occur in low-leverage situations when the play doesn't come in on time, or after a big play when they don't get to the line quick enough. In a lot of these situations, the detriment of a 5 yard penalty is far less than not having it at the end of the game. I would love to see a study on it, though. I don't know how you could measure how much the timeout increased the value of a play because you can't have a control group. You could try comparing audibles, but there will always be a sample bias. you could do a training camp experiment where the defensive line up messes up the offense and randomly call timeouts and see I'd the plays are more successful, but its not great data. I like the word 'tufty.' Never seen it before, must be an East Coast thing.